If you haven't seen it already, the most recent issue of Vice is chock-full of comics and manga. 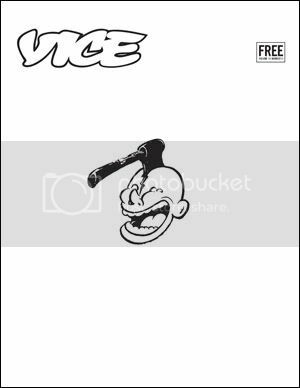 For the "No Pictures" issue, Vice went all out and has featured a number of interview features with artists & designers, including friends of Same Hat like illustrator Matt Lock (featured in Electric Ant #1) and painter Mimi Leung. Under the tutelage of Editor-in-Chief Jesse Pearson (who provided us with free copies of the Shintaro Kago interview) issue, along with help from Johnny Ryan and Vice Japan editor Tomo, Vice has also expanded the Vice Manga section to include three chill artists. These are not so much manga, but large illustrations by the hilarious and strange painter/photographer. Click here for the articles on Vice, or check out an excellent biography and gallery of Imiri Sakabashira's art on Bill Randall's site. 9You know him, you love him. It sounds like Kagomaniacs will be a regular page in Vice going forward... very cool! Click here for the Radio Wada section of Vice. His website is also a great place to head for more of his work. As always with Vice, this leaves me feeling conflicted. I loathe Vice; their snooty-snarky holier-than-thou urban hipster "Gee, I sure hate everyone" attitude drives my nuts. At the same time, much of their artistic content is top-shelf, and this is no exception. -supporting the popularity and success of some of my favorite artists. Happily, Vice is a free publication (and they put all the cool stuff like this) online, so you can do it a la carte if you wish and free yourself of those mental conflicts! Jesse Pearson deserves credit for getting some of these folks, too, including Kago. @anonymous: Yeah, most of the worthwhile stuff was linked or posted in this blog missive, save one other cartoonist and Johnny's stuff. Hunting through viceland.com is the best way for the a la carte sampling.